I am a satisfied Debian user since I moved away from Windows in 2008. Back then I thought I could trick the market by ordering one of the very few systems that didn’t come pre-installed with proprietary software. Therefore I went for a rather cheap Acer Extensa 5220 that came with Linplus Linux. Unfortunately it didn’t even have a GUI and I was totally new to GNU/Linux. So the first thing I did was to install Debian because I value the concept this community driven project. I never regretted it. But the laptop had the worst possible wireless card built in. It never really worked with free software. In the mean time I have learned a lot and I started to help others to switch to free software. In my experience it is rather daunting to check new hardware for compatibility and even if you manage to avoid all possible issues you end up with a system that you can not fully trust because of the bios and the built in hardware (Intel ME for example). Therefore I am very excited that you can actually order hardware nowadays that others have checked for best compatibility already. Since my old laptop got very unreliable recently I wanted to do better this time and I went for the Technoethical T400s, which comes pre-installed with Trisquel. I am very pleased with the excellent customer care and the quality of the laptop itself. I was especially surprised how lightweight and slim this not so recent device is. When the ThinkPad T400s was first released in 2009 it was reviewed as an excellent, well built but rather expensive system for about 2000 Euros. The weakest point was considered the mediocre screen. The Technoethical team put in a brand new screen which has perfectly neutral colours, very good contrast as well as good viewing angles. I’ve got 8 GB RAM (the maximum possible), an 128 GB SSD (instead of 64 GB) and the stronger dualcore SP9600 with 2.53 GHz (instead of the SP9400 with 2.40 GHz) CPU. In addition I’ve received a caddy adapter for replacing the CD/DVD drive with another hard disk. And all this for less than 900 Euros. This is the most recent laptop of the very few devices worldwide that come with Libreboot and the FSF RYF label out of the box. The wireless does flawlessly work right away with totally free software. This system fulfills everything I need from a PC as a graphic designer. Image editing, desktop publishing, multimedia and even light 3D gaming. Needless to say that common office tasks as emailing and web browsing do of course work flawlessly. To get everything done properly only few people do actually need more powerful working machines. Even the webcam does work out of the box without any issues and the laptop comes back from its idle state well too. I didn’t test the fingerprint reader and bluetooth. Over all this is a great device that just works with entirely free software. I thank the Technoethical team for offering this fantastic service. 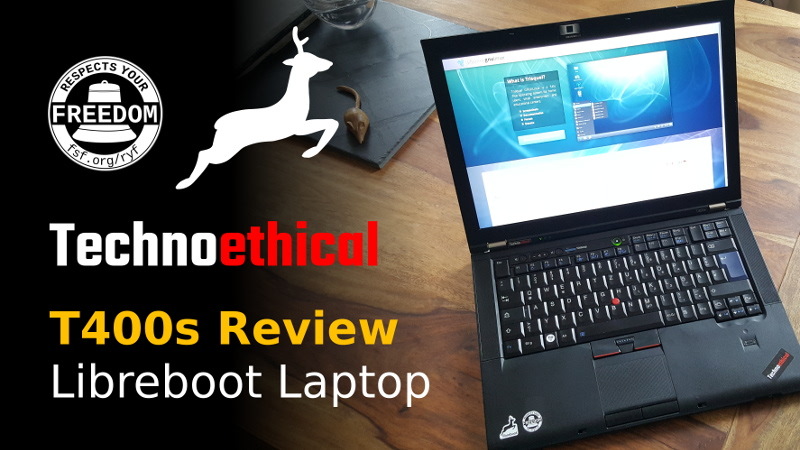 I can only recommend buying one of those T400s laptops from Technoethical. This entry was posted on Saturday, August 19th, 2017 at 18:54	and is filed under English. You can follow any responses to this entry through the RSS 2.0 feed. You can leave a response, or trackback from your own site. Regarding battery life: I am not completely sure, but you should be able to add a second battery instead of the 2nd hard drive. Just look for “Ultrabay Slim Battery” (FRU 51J0508) – they sell for around 20-30 Euros on Ebay. Have fun with your T400s, I also enjoy libre Software down to the firmware on my X200(s) and my T500 (upgraded with Quadcore CPU).